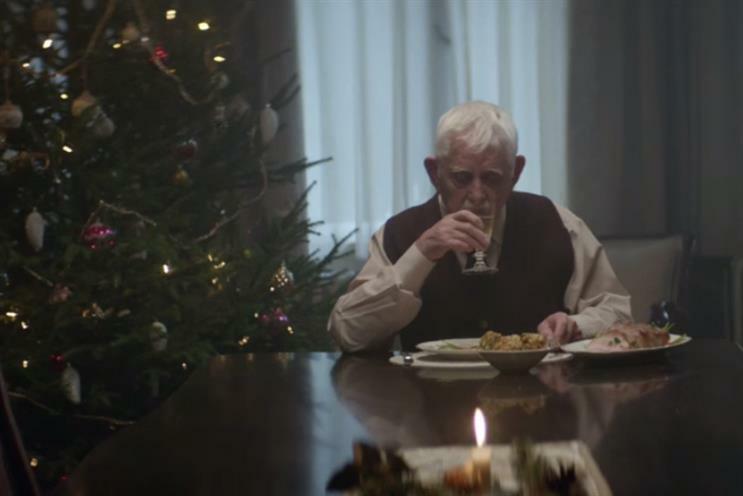 The German supermarket Edeka has upped the ante in the competition for the saddest festive ad, with a film in which an old man resorts to drastic measures to bring his family together. The new ad is called "#HeimKommen" (or home coming) and will run on TV in Germany. It was reportedly created by Jung von Matt and has been viewed more 5.5 million times on YouTube since it was released on 28 November. The spot opens on an old man receiving a voicemail from his daughter saying she won’t be able to make it home for Christmas. Time-lapse editing then shows the grandfather spending successive Christmases alone. In the next scene, the man's children are all shown receiving news that their father has died, and all gather at his home for the wake, only to be surprised by the man himself, who asks "how else could I have brought you all together?" This is not the first ad created for Edeka by Jung von Matt that has proved popular online. In 2014 the agency filmed the German musician Friedrich Liechtenstein singing his electro-pop song Supergeil while fondling various grocery items, and the video has been viewed more than 15 million times on YouTube. The themes of the supermarket's Christmas ad parallel those of this year's John Lewis campaign – a metaphor for loneliness among the elderly in which a young girl strikes up a friendship with an old man who lives on the moon.